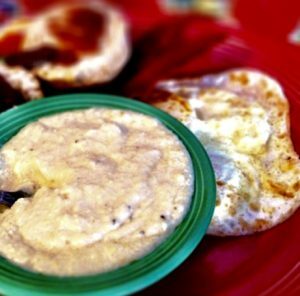 When I first moved to the South years ago, one food item stood above the rest as an introduction to my adopted new food culture: Grits. Though not commonly spotted on Northern menus, grits are a standard feature on Southern menus, from humble eateries to fine dining establishments. Grits are a humble ingredient and can be prepared a number of ways, from thick and creamy to light and fluffy, from runny to firm cakes. In skillful cooks’ and chefs’ hands, grits are treated to such inventive uses that the more I discovered about grits the more my infatuation with them grew. Grits were first produced centuries ago by Native Americans and today are produced by small family mills as well as large conglomerates. Grits are made of corn, and can be produced straight from the kernel or from hominy. When milling corn kernels the hull and germ are removed first. Hominy is made by soaking corn until the bran breaks away and the kernel has doubled in size. Typical varieties of grits include stone ground, regular, quick and instant. Quaker, one of the nation’s largest producers of grits, mills corn in heavy steel rollers before separating the granules by size using a screening process. The largest granules are grits; smaller pieces are cornmeal and corn flour. At Falls Mill in Belvidere, Tennessee, corn is milled between granite burrs using a 100-year-old water wheel in batches of about 125 bushels of hybrid white corn at a time. 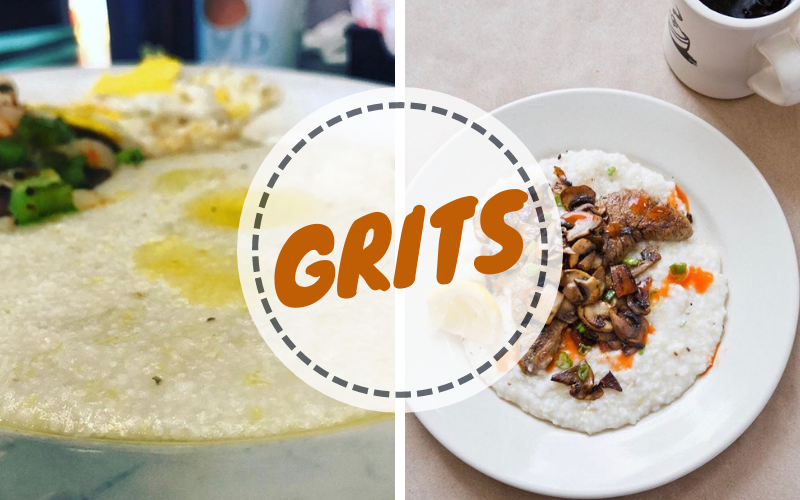 Households with Southern roots consider grits a culinary mainstay—and that’s lip-licking good news. Tips, tricks and recipes have been passed down through generations. I continue to be amazed how this milled corn is amazingly compatible with a seemingly countless range of food styles, from savory to sweet, creamy to fluffy, whether served as a breakfast side or part of an extravagant dinner at a Michelin Award-winning restaurant. A true southern staple, grits are most simply served piping hot, seasoned with salt, pepper and butter. Add cheese, jalapeños, mushrooms, roasted tomatoes, and other ingredients to achieve different flavors—grits are so versatile! No matter how they’re topped, I’ve discovered that grits are delicious when prepared properly (and there’s a definite quality difference you can taste between stone ground grits and instant grits). 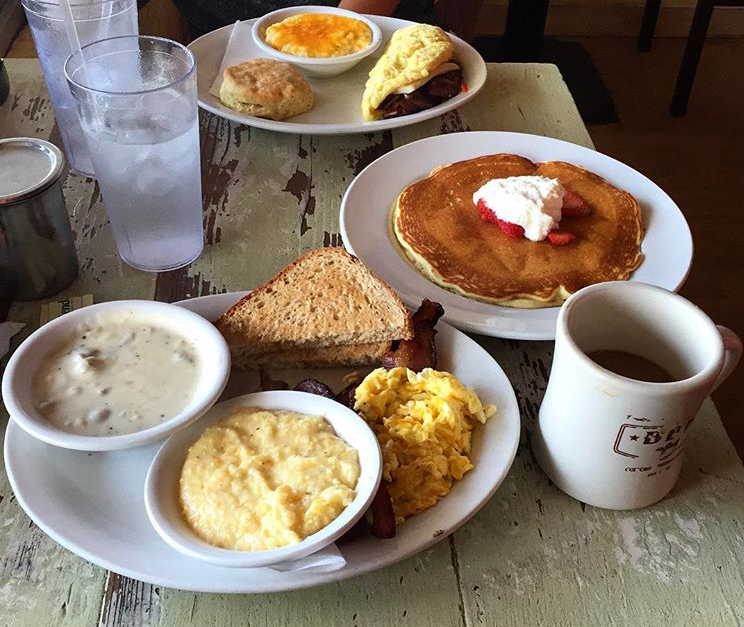 Here’s a list of destinations across the Southeast that serve creative, delicious grits. The grits at these places impressed me so much that I can’t wait to get back and order another helping. James Beard Award winner Chef John Currence uses stone ground grits from Mississippi’s Original Grit Girl https://www.gritgirl.net/, a small business that uses locally grown corn that’s milled fresh to order. Served piping hot, Big Bad Breakfast’s grits game will not disappoint. This time-honored establishment located in the French Quarter serves a classic corn grits recipe alongside an all-day jazz brunch buffet. A treat for the eyes, ears and taste buds. Mention grits in Charleston, and you will undoubtedly be pointed in the direction of Hominy Grill. Its chef-driven grits bowls are topped with sautéed shrimp, fried catfish or smoked pork belly, and ranks among the city’s best bites. Mimosa Grill does Sunday brunch right with a specialty grit bar showcasing local North Carolina grits. You can add a variety of toppings, making sure that you get a customized taste experience. This eatery may be affectionately called a “greasy spoon” by many thanks to its down-home vibe, but everyone from neighborhood regulars to vacationers agree this small, family-owned eatery serves up classic grits topped with smothered shrimp so good that it’s worth waiting in the line that often wraps around the corner for the chance to dig in. 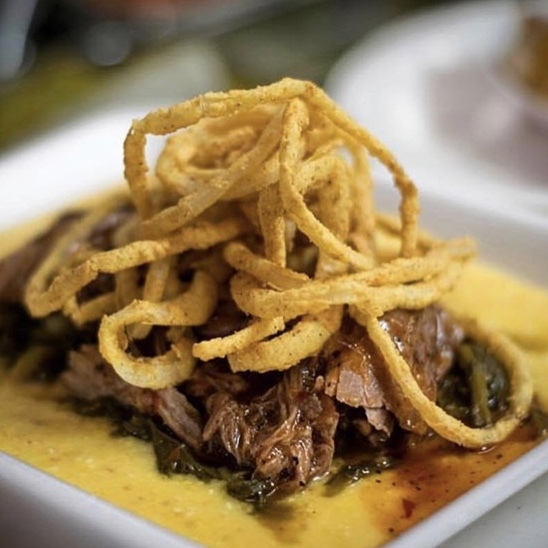 Widely known for its barbecue, Saw’s elevates its cheesy grits with toppings of smoked pork, tangy greens and crispy onion rings, making this dish eye-catching, mouth-watering and a must-try. Grits aren’t solely for breakfast. Soby’s in downtown Greenville serves barbecue shrimp over its cheesy grits, creating a savory forkful that elevates taste buds to the next level with every bite. Chefs commonly use grits as a foundation for creative toppings and this place in Nashville is a great example. The smoked Gouda chipotle grits milled in-house elevates this rendition of shrimp and grits to a menu standout. This three-day extravaganza showcases tasty varieties of the iconic Lowcountry dish from restaurants throughout Georgia. 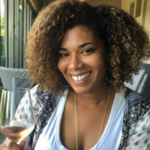 The festival also features musicians, artisans, craft beers, a children’s play area, Southern foodstuffs and dishes beyond grits, and a relaxed, island vibe.